For years, this company was called “Clear Ideas Consulting.” During that time, my signature leadership class was entitled The 21st-Century Leader, because I believed the new century (and millennium) required a new approach to leadership – one grounded in self awareness, adaptability, and shared power. And I still believe that wholeheartedly. Then one morning a few years ago, I was struggling on a long training run. It was one of those rare days when I just wasn’t feeling it. I was tired. It was cold and rainy. And I had a lot of other things I could be doing back in my warm, dry office. But I was in the midst of an intense training cycle for a marathon at which I hoped to set a P.R. (Personal Record) – and that meant skipping or abbreviating my long run that day was not an option. So I told myself just to keep putting one foot in front of the other. Sometimes in life the ONLY thing you can do is keep putting one foot in front of the other – whether you’re running a marathon, managing a small project team, overseeing a large department, or leading an entire organization. Now it was raining that day, so it’s possible (albeit unlikely) that a bolt of lightening and a crash of thunder accompanied that moment of “a-ha.” But what did accompany that initial eureka were further examples of how my avocation (running marathons) had a lot in common with my vocation (leadership training and coaching). Suddenly, my feet felt lighter and the cold and rain more bearable, as I mentally chewed on this notion for the remainder of the 15-mile run. When I got home, I threw on dry clothes, headed to my office, and began to compile a list of the leadership lessons I’ve learned over the years by training for and completing marathons, as well as commentary on why learning and living those lessons are a requirement for anyone wanting to be a better leader – both runners and non-runners alike. It was time to re-brand my company. Since that time, this company has been called Marathon Leadership®. And The 26.2 Lessons Every Leader Must Learn and Live have been the foundation of my leadership training and coaching work with others – whether those individuals are marathoners, recreational runners, or self-avowed “couch potatoes” who don’t like to drive 26.2 miles, let alone run that distance. In fact, some of the biggest successes I’ve had coaching leaders have been with individuals who hated running but completely understood and bought into the concept of the marathon as a metaphor for becoming a better leader. And I wholeheartedly believe that metaphor is appropriate for two reasons. First, running a marathon and becoming a better leader both require you to undertake a deeply personal and transformational journey. And because I’ve personally taken those journeys, as well as coached others during their journeys, I know for a fact that the 26.2 Lessons help folks on their individual leadership journeys. Second, a marathon now symbolizes so much more than just a running event. In popular lexicon, “marathon” is used to describe any epic or heroic effort. Writers and broadcasters refer to “marathon battles,” “marathon negotiations,” and “marathon debates on the floor of the Senate.” And over the years, countless products and even entire organizations (such as Marathon Oil) have included the word “marathon” in their names to create the impression of endurance and durability. These powerful associations with “marathon” are ultimately why I want to create “marathon leaders.” Becoming one involves ordinary people working extraordinarily hard to build the endurance and durability to solve the problems and challenges facing their community, political, and business organizations. This is critical because most of the world’s problems will not be solved by management, which is a short-term sprint. They only will be overcome through effective marathon leadership, which focuses on the long-term. Lesson 1: Leadership is a marathon - management is a series of sprints. My business card before I re-branded the company in 2008. 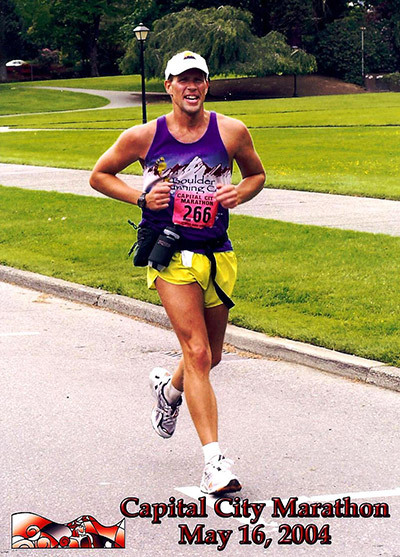 The 2004 Capitol City Marathon in Olympia, WA is still my PR (fastest marathon) at 3:52:25. 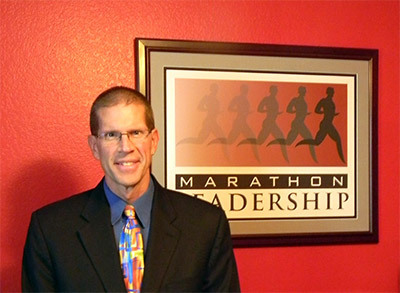 "Marathon Leadership®" is my flagship training program and is based on The 26.2 Lessons Every Leaders Must Learn and Live.